It’s hard to balance eating the things we want with moving our bodies enough to work off what we consume. In the summer we want to keep cool, and it is very easy to eat lots of the sugar-filled fat bomb known as ice cream. Instead of shoveling this delicious treat into our faces without trying to fend off consequences, we often wallow in our inability to head to the gym instead (maybe that’s just me). If you’d prefer to earn this treat through participating in some physical activity, then why not play a little kickball while making it? In fact, why don’t you make the ball the method of making your dessert? 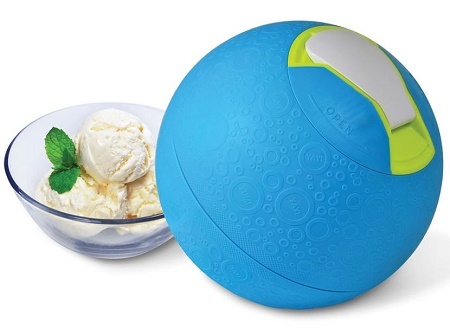 The Kickball Ice Cream Maker is just like many ice cream makers we’ve seen in the past, but this one has a twist. Load your cream, sugar, vanilla, and any other flavor-inducing ingredients into the food-safe sealed compartment, put rock salt and ice into the second compartment, and kick it around for 20 minutes. After you’re tired of playing ball, there will be plenty of creamed ice for you to enjoy. In reality, this would probably just get your adrenaline going to the point that you would actually want to keep playing. If you don’t think you feel like being that active and just want to have some ice cream without the use of electricity, you can just shake this or poke it around the house with your feet for 20 minutes. This is a $35 purchase that has the potential to be fun and rewarding, though it may up your intake of ice cream.